Things are really hotting up here at Litfest HQ, plans are romping ahead and bookings are pouring in for events at this years Kerrygold Ballymaloe Literary Festival of Food and Wine which Condé Nast Traveller has described as one of the top 10 ‘Best Festivals in the World’. In just four years this festival which Rory O’ Connell and Rebecca Cronin have skilfully and brilliantly curated has attracted participants and food lovers not just from these islands but from all over the world to come to Ireland to meet and watch their favourite cooks, chefs and food writers. Others are packing their bags to come to see their icons from the food and beverage world. We’ve gathered together a dynamic pool of writers, chefs, cooks, foragers, many whom, we would never have the opportunity to see or hear unless we travelled thousands of miles to deepest Mexico to meet Eric Warner and Mya Henry from Hartwood to Argentina to meet a powerhouse like Frances Mallman – ‘King of Fire’ who is featured in the Netflix documentary The Chef’s Table. For those who may not have been here before the events take place at Ballymaloe House, Ballymaloe Cookery School, The Grain Store at Ballymaloe, on the farm and in the gardens and of course the huge Fringe Festival and the Drinks Theatre will be rocking along simultaneously in the Big Shed. The Grainstore will have a new setup to previous years and will bring a fast-paced, dynamic and enthusiastic edge to the festival. At Litfest16, The Grainstore will be transformed into an exciting auditorium staging a thought-provoking and inspiring series of short talks and presentations, giving us the most up to the minute news of what’s happening in the world of food and drinks. But this is a cookery column so who are the exciting cooks and chefs giving cookery classes at the Ballymaloe Cookery School in the 2016 Kerrygold Ballymaloe Literary Festival of Food and Wine. 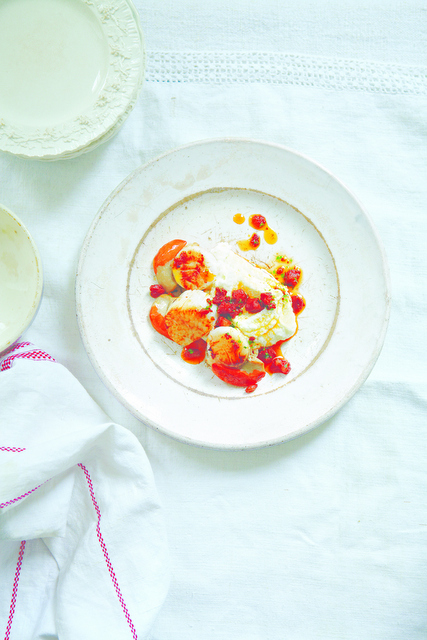 Well, the guys from Hartwood, Yotam Ottolenghi of course but also Ramal Scully of NOPI have chosen some recipes from their new NOPI cookbook. The irrepressible Jeremy Lee from Quo Vadis in London will share some of the dishes that lure people back to his establishment in Soho over and over again. My favourite London baker Claire Ptak from Violet Cakes will be in the Dem Theatre at the Ballymaloe Cookery School on Sunday. And guess what, the authors of my favourite book of 2015, Bar Tartine Techniques and Recipes, Nicolaus Balla and Cortney Burns will also be here. Those of you enchanted by preserving and fermentation must not miss these two alchemists from Bar Tartine in San Francisco. As ever there is a strong Irish presence and Katie Sanderson of the Dilisk Project in Galway, one of the most exciting new voices in food will give a cookery dem on Sunday. Fans of Kamal Mouzawak from Beirut and he has many fans in Ireland will want to catch up with him at 3.30 on Sunday in the Blue Dining Room at the BCS. Now this is just a taste of over 100 events on the weekend of 20-22 May 2016. So check out www.litfest.ie. Some events are already sold out but there are still lots of good things to explore. Here is a taste of what’s to come. First make the lime butter. Put the butter in a medium bowl and beat with a wooden spoon until it turns soft and creamy. Stir in the rest of the ingredients. Tip onto a sheet of cling film and roll into a sausage shape. Twist the ends of the film to seal the flavoured butter. Chill until firm. Wilt the spinach in a pan with a splash of water. Drain in a sieve and when cool, squeeze hard with your hands to remove as much moisture as possible. Roughly chop and put aside. For the pancake batter, put the flour, baking powder, whole egg, melted butter, salt,cumin and milk in a large mixing bowl and whisk until smooth. Add the spring onions, chillies and spinach and mix with a fork. Whisk the egg white to soft peaks and gently fold it into the batter. Pour a small amount of olive oil into a frying pay and place on a medium heat. For each pancake, ladle 2 tablespoons of batter into the pan and press down gently. You should get smallish pancakes, about 7cm in diameter and 1 cm thick. Cook for about 2 minutes on each side, or until you get a good golden green colour. Transfer to kitchen paper and keep warm. Continue making pancakes, adding oil to the pan as needed until the batter is used up. To serve, pile up three warm pancakes per person and place a slice of flavoured butter on top to melt. If you can’t find red quinoa, the more widely available white quinoa can be used in this recipe. It will need a couple of minutes less cooking time than the red. Place the shallots in a small bowl with 1 teaspoon of salt. Mix well and set aside for 5 minutes before adding the sugar, sumac and vinegar. Mix again and set aside for another 30 minutes. Bring a small pan of water to the boil and add the quinoa. Return to the boil and then cook for 11 minutes. Drain, refresh well under cold water and then set aside until completely dry. To make the dressing, place the lemon juice and mustard in a bowl with 1 teaspoon of salt and a good grind of black pepper. Mix continuously as you slowly add the olive oil. Strain the shallots and put them into a large mixing bowl, along with 1 tablespoon of the pickling liquid. Add the quinoa and watercress, pour over the dressing. Combine everything gently and serve. Preheat the oven to 180°C/350°F/gas mark 4. Butter a 9 inch (23 cm) round cake pan. Line with baking parchment and butter the parchment. Whisk together the flour, cinnamon, baking powder and salt in a medium bowl. Next zest the grapefruit and segment the fruit. First, slice off the top and bottom of the grapefruit so that you can see two tiny circles of flesh. Slice off the skin, pith and outer membrane. Trim off any white patches left after you cut off all the peel. Holding the fruit in one hand and a sharp knife in the other, working over a small bowl, slice as close as possible to the membranes that separate the sections. Slice along one, then the other and flick the loosened segment into the bowl. When the entire fruit is segmented, squeeze the juice from the remaining membranes with your hand and reserve. Cream the butter and sugar in a large bowl until light and fluffy. Add the eggs one at a time mixing well after each addition. Add the vanilla extract and mix to combine. Add the yoghurt, sweetened condensed milk and ¾ cup of honey. Mix the dry ingredients into the wet ingredients, being careful not to over mix. 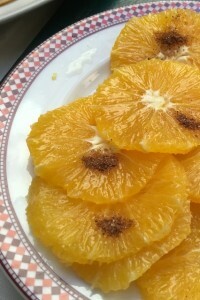 Arrange the grapefruit segments in concentric rings in the bottom of the cake pan. Pour the remaining ¼ cup of honey over the grapefruit. Pour the batter into the pan. Bake for 45 minutes, or until a cake tester inserted into the centre comes out clean. Transfer the pan to a rack and let cool. Next make the caramel. Combine the water and sugar in a medium saucepan, bring to a simmer and simmer until the sugar melts and the caramel turns a dark amber colour. (be careful at the end – it can burn quickly). Add the reserved grapefruit juice, the caramel will bubble up and swirl to incorporate, then add the mescal and continue swirling until the caramel returns to an amber colour. Add the honey, grapefruit zest and butter, swirl to incorporate, then take off the heat. To serve, turn the cake out on a cooling rack and remove the paper. Transfer to a serving plate and pour over the warm caramel. Dust with icing sugar. Note: Mezcal is a distilled spirit made from the Maguey plant native to Mexico. Tequila can be used as a substitute. Wouldn’t you love to be able to make your own butter. We will teach you how and also make yoghurt, cottage cheese, labneh, paneer and a simple farmhouse cheese on Wednesday morning, May 5th at the Ballymaloe Cookery School. Students who would like to learn how to milk a cow can join us at 8.30am when we milk our Jersey cows and separate the milk and cream in our micro dairy www.cookingisfun.ie for more info. Hear the story of Irish tortillas. Blanco Nino is based in Clonmel, Co Tipperary producing all natural, authentic, naturally gluten free and all round awesome corn tortillas and tortilla chips. Philip Martin works with great, passionate and sustainability-focused farmers growing non-GM corn and he will be at the Cookery School on Thursday May 5th to tell us his story. www.slowfoodireland.com for more information. Have you ever tasted Dexter beef? Slow Food North West will host a Dexter beef spring barbecue and beer tasting on Sunday May 8th in Hamilton Castle, Manorhamilton, Co. Leitrim from 1pm. Meet the charcoal maker, the farmer and the master brewer. Tel 083 486 9467 or www.slowfoodnorthwest.com for the details. Claudia Roden, one of the world’s best known and best loved cookery writers has just celebrated her 80th birthday. I was fortunate enough to be invited to a wonderful party in Claudia’s honour during the Oxford Literary Festival at Oxford Brooks University recently. It was hosted by Donald Sloan, chair of Oxford Gastronomica and head of the specialist centre for the study of food, drink and culture at the university. It was a splendid evening with so many food writers and cook book authors gathered together to pay homage to lovely Claudia who has contributed so much to our knowledge of so many diverse cuisines. Claudia was born and brought up in Cairo before moving to the UK to study art. She longed for the food of her homeland and collected recipes from the many who had to flee their war torn country. Her best seller, A Book of Middle Eastern Food published in 1968 revolutionised our attitude and knowledge of food of the Middle East, Claudia went on to write many other award winning cookbooks on the Food of Italy, Spain, the Mediterranean, a book on coffee, another on picnics and a hugely acclaimed book on Jewish Food. Her writing is distinguished by her interest in the social and historical background to the food she writes about and has deservedly received tremendous critical acclaim worldwide. Claudia was one of the first guest chefs to teach at the Ballymaloe Cookery School and has returned to inspire us on several occasions including the Kerrygold Ballymaloe Litfest in 2014. The meal was cooked by another of my favourite chefs, award winning José Pizzarro who came to London from Madrid to open José Tapas Bar in 2011 followed by Pizarro Restaurant and most recently a third restaurant in Broadgate Circle in the City. His food is simple, honest and utterly delicious and he and his team of 7 chefs certainly didn’t disappoint. Several little pica pica to nibble with drinks. Skewers of pata negra, croquettes and ??? Claudia’s grandson Caesar made the most delicious rum and raisin ice cream pops a truly delicious finale to a memorable meal. José newest book Basque celebrates the food of his native region on the Spanish/French border – you’ll love his simple recipes – Here’s a taste. Mary Kay has an enticing selection of gluten free produce at her Ladsybridge Cottage Market stall. The gluten free brownies and biscuits are her best sellers. Tel Mary Kay on 086 8277117. Join Slow Food Mayo tomorrow, Sunday April 24th at 10.00am for a day of foraging. The group will meet at Murrisk Abbey carpark, near Westport. Families are welcome…followed by a foraged picnic. The excitement is building here at Ballymaloe for this year’s Litfest, it’s difficult to imagine that the line-up for 2016 could top last year’s stellar cast but go on line and check it out. Yotam Ottolenghi is coming back. Francis Mallmann who is featured on The Chefs Table is coming all the way from Argentina. The theme this year is ‘Our Food – what’s the Story’? Events over at Ballymaloe House, the Cookery School, Grain Store and the Big Shed. Book ahead to avoid disappointment, some are already booked out but there’s still lots and lots to choose from. www.litfest.ie. Condé Nast Traveller List described the Kerrygold Ballymaloe Literary Festival of Food as ‘Best Festivals around the World’. This is a perfect tart to make in advance as it lasts for 2 or 3 days easily. I always make it with orange blossom honey to give a fruity, floral flavour to the tart. You could serve it with ice cream as dessert or on its own for tea. For the pastry, sift the flour, salt and icing sugar into a food processor. Add the butter and lemon zest and process briefly until the mixture resembles fine breadcrumbs. Beat the egg yolk briefly with the water. Tip the crumbed mixture into a bowl, stir in the egg yolk mixture and bring the dough together into a ball. Turn out onto a lightly floured surface and knead briefly until smooth. Chill for 15 minutes, then remove from the fridge and thinly roll out into a disc and use to line 23cm, loose-based tart tin with sides 2.5cm deep. Refrigerate for 20 minutes. Put a baking sheet on the middle shelf of the oven and preheat it to 200°C/gas mark 6. Line the pastry case with foil and a thin layer of baking beans and bake for 15–20 minutes until the edges are biscuit coloured. Remove the foil and beans and bake for another 5–7 minutes or until the base of the case is crisp and golden brown. Remove and set aside. Reduce the oven temperature to 180°C/gas mark 4. For the filling, melt the butter in a medium pan over a low heat. Add the sugar and honey and stir gently until the sugar has dissolved. Then raise the heat and simmer vigorously for 4 minutes. Add the cream (be careful as it will splutter a little) and boil for a further 3 minutes. Stir in the lemon juice. Remove from the heat and leave the mixture to cool until just warm, then stir in the beaten egg. Arrange the walnut halves over the base of the pastry case in an even layer and pour over the honey and cream mixture. Bake for 30–35 minutes until the filling is set and golden brown. Serve warm, cut into wedges. This is traditionally fried in a large pan, but I find it easier to make in a large roasting tin. It is a great side dish with any roasted or barbecued meat. And for a quick supper this is wonderful topped with a couple of fried eggs. Why called poor man’s potatoes? Preheat the oven to 230°C/gas mark 8 and bring a large pan of well-salted water to the boil. Cut the potatoes across into 7–8mm thick slices, drop them into the water, bring of a knife. Drain well. Halve the red and green peppers and remove and discard the stalks and seeds. Cut them into 1cm wide strips. Put them into a large roasting tin (measuring about 30 x 40cm) with the potatoes, onions, garlic, bay leaves and thyme leaves. Season with 2 teaspoons of sea salt and plenty of black pepper, pour over 4 tablespoons of the remaining olive oil and toss well together. Spread everything out in a single even layer and drizzle over the rest of the olive oil. Roast on the top shelf of the oven for 20 minutes, then remove the tin and turn the vegetables over. Return to the oven and roast for a further 20 minutes, until the potatoes are golden and the other vegetables are tender and nicely caramelized here and there. Serve straight away. I remember coming home when I was a child and going to the fridge and taking out a whole flan (crème caramel) and eating it all. At home, we don’t serve them individually but as a whole. I think it is even better with the addition of orange zest and this recipe is now top of my list of desserts and that’s why I serve it in my restaurant Pizarro. Preheat the oven to 160°C/gas mark 3. Place a shallow 1.5 litre oval baking dish into the oven to warm. Put 175g of the sugar into a medium pan with 100ml cold water and leave it over a low heat until the sugar has dissolved, then increase the heat and boil rapidly until the mixture has turned into a dark amber caramel. Remove from the heat and quickly pour he caramel into the warmed dish, tilting it forwards and backwards to cover the base and 1cm up the sides in a thin, even layer. Set aside. Put the milk, remaining sugar and orange zest into a clean pan and bring to simmering point. Remove from the heat and set aside for 30 minutes. Put the eggs and egg yolks into a bowl and whisk together lightly. Strain the orange-infused milk and whisk it into the eggs. Pour the mixture into the baking dish and put it into a small roasting tin. Pour hot (but not boiling) water into the tin until it comes half way up the sides of the dish. Bake in the oven for 45–50 minutes or until the mixture has just set but still has a slight wobble in the centre. It will continue to firm up as it cools. Remove the dish from the roasting tin and leave to cool, then chill for 6 hours or overnight. To serve, run a round-bladed knife around the edge of the dish and invert onto a serving dish. Pour over the caramel juices and serve. When I was young I would regularly make myself a dish of potatoes and green peppers fried in olive oil, topped with a fried egg, especially mid-morning after a late night out. 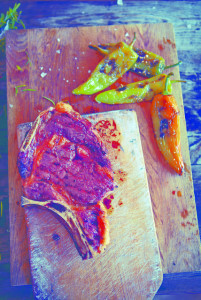 In the north of Spain chuleton, a large beef rib chop, is often served with fried pimientos de Padrón, those fiery little green peppers from Galicia, but these can be difficult to get hold of in the UK. Long thin Turkish green peppers work particularly well in this dish, or you can use ordinary green peppers, just cut them into quarters lengthways. Preheat your barbecue to high or place a ridged cast-iron griddle over a high heat. Heat the oil in a large frying pan over a medium heat. Add the green peppers and fry for 12–15 minutes, turning regularly, until they are soft and nicely coloured. Add the garlic and rosemary and fry for a further 1–2 minutes. Season to taste with salt and pepper and set aside t o keep warm. Manwhile, rub the forerib of beef with some oil and season well all over with salt and pepper. Barbecue or griddle the beef for about 6–7 minutes on each side for medium rare, or until the centre of the meat registers 65°C on a meat thermometer. Transfer it to a board, cover with foil and leave it to rest for 5 minutes, during which time the internal temperature will rise to 70°C. To serve, cut the meat away from the bone and then diagonally, like a steak, into slices. Serve with the fried green peppers and some patatas fritas (chips). The north-western region of Galicia is bordered on two sides by the Atlantic ocean and so it is not surprising that the cuisine of the area is greatly influenced by the sea. The Rias Bajas provide the perfect conditions for farming scallops and produce some of the highest quality scallops in the world. The scallop shell is also the symbol of the town of Santiago de Compostella, the destination of pilgrims from around the world. Every year I promise myself I will make the effort to do the walk, but, as with the London marathon, I never quite get around to doing it! This dish is not traditional in the area, and some people might think it more French than Spanish, but I love this combination of flavours – the cauliflower and the spicy chorizo go so well with the sweetness of the caramelised scallops. Bring the milk to the boil in a large pan. Add the cauliflower florets and 1 teaspoon of salt, return to the boil and cook for 7 minutes until tender. Drain well, reserving the milk. Put the cauliflower into a food processor with 3 tablespoons of the milk and 2 teaspoons of the oil and blend to a smooth purée. Season to taste with salt and pepper, transfer to a small pan and set aside over a low heat to warm through. Heat 4 teaspoons of olive oil in a small frying pan over a medium heat. Add the chopped chorizo and fry it gently for 1 minute until just golden brown. Stir in the vinegar, parsley and a pinch of sea salt. Keep warm. Heat a non-stick frying pan over a high heat. Rub the scallops with the remaining oil, add them to the pan and sear for 2 minutes on each side, seasoning them as they cook. To serve, spoon some of the cauliflower purée onto 4 warmed plates and arrange the scallops alongside. Spoon over some of the chorizo oil and serve. ‘Five star Michelin and no diarrhoea’ shouts the enthusiastic tout in Jemma al Fnad square in Marrakesh trying to out-yell his competitors to entice customers to eat in his stall. Its a crazy scene, everyone seems to be leaping around trying to sell somebody something….the square is relatively quiet during the day but by sunset it springs into a frenzy of activity, snake charmers play their tunes and wrap snakes around the necks of hapless tourists. Women grab your hand in a vice like grip to entice you to have a henna tattoo painted on. Toy sellers stuff little drums into children’s hands as though it was a gift and then demand money when you try to prize it out of the confused child’s hands. NO is a word no one appears to understand or certainly ignores with a beaming smile. On the left of the square, a row of colourful carts sell freshly squeezed orange juice for 4 dirhams a shot, but you need to be cautious, it can be diluted with tap water which can certainly result in the aforementioned affliction. Belly dancers gyrate to a rhythmic beat, everyone is on the make and the energy level is off the scale. Row after row of stalls sell offal and sheep’s head soup. Harira, the thick soup which Moroccans eat at sunset to break their fast during Ramadan is another popular offering. Snail sellers pass bowls of steaming molluscs in broth to adventurous diners, I don’t love it, I prefer my sails smothered in garlic and parsley butter in the French tradition. We eventually relented and sat at one of the oilcloth covered tables to enter into the banter, lots of little dishes of mezze arrived, aubergine purée, harissa, fresh tomato purée, Moroccan salad and a basket of the flat bread. This was followed by Moroccan fish and chips, crispy little sole, squid and chunks of an eel like fish with lots of chips. It was all perfectly edible but not exactly a gastronomic experience. I also love the spicy merquez sausages stuffed into a roll and of course, Mechoi, the meltingly tender slow cooked, milk fed lamb that’s served on a sheet of brown paper with salt and cumin. Seek out Meschoi Alley on the east side of the medina, Here, you can also order a tangia, a earthenware pot with a stew inside. This is a fascinating tradition, which has endured over many centuries, a poor person would own just one earthenware pot, shaped a bit like a jug without a handle or spout, they would walk around the market from stall to stall, getting a few bits of veg at one, small scraps of meat at another, a glut of olive oil , a few spices many a pinch of saffron, a bit of seasoning and then the pot would be covered with greaseproof and secured with string, this was buried in the embers at the Hamman and cooked slowly to melting tenderness. The flavour is absolutely delicious. There are few really exciting restaurants in Marrakech perhaps with the exception of Al Fassia, a restaurant run entirely by women. 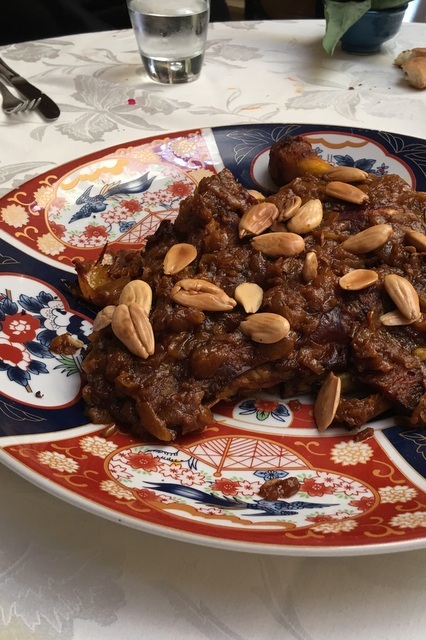 The food is close to home cooking where unquestionably the best food in Morocca is to be found. Absolutely everything we ate there was delicious. We were a big family group so we had the opportunity to taste many dishes on their menu, in fact our lunch was so good that I returned for dinner. The mezze of 15 little salad dishes was superb and the pigeon bistylla in flakey, home made warka was worth travelling to Marrakech specially for. There was a choice of seven tagines, some sweet and others savoury. The chicken with lemon and green olives of course, another with shallots and almonds, We also tried two sweet ones, one with caramelised onions and raisins and another lamb tagine with tomato jam. Yet another with caramelized pumpkin. There were several others, I particularly remember a lentil tagine and a wonderful vegetarian version. Delicious date icecream for dessert and refreshing orange slices sprinkled with cinnamon and sugar were perfect after a rich tagine or cous cous. There were also Moroccan pastries of which there is a bewildering selection, but at Al Fassia they serve just one simple biscuit, delicious to dunk in mint tea. 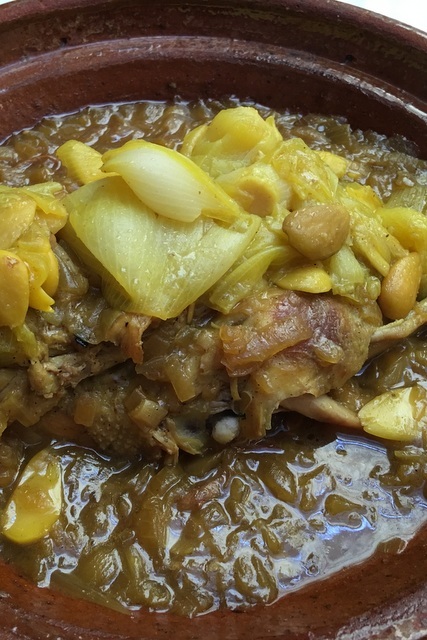 In Morocco this soup is served as an important part of the festivities of Ramadan. It’s the traditional soup to break the fast. My brother Rory O’Connell shared this particularly delicious version with us and everyone loves it. Tip the chickpeas and lentils into a large saucepan. Add the lamb, onion, turmeric, cinnamon, ginger, saffron strands and paprika, then pour in 1.5 litres (2 1/2 pints/6 1/4 cups) water. Season with salt and freshly ground pepper. Bring to the boil, skimming all the froth from the surface as the water begins to bubble, then stir in half the butter. Turn down the heat and simmer the soup, covered, for 1 1/2 – 2 hours until the chickpeas are tender, adding a little more water from time to time as necessary – it can take up to 900ml (1 1/2 pints/3 3/4 cups ) more water or stock, it should be soupy in texture. Towards the end of the cooking time, prepare the rice. Bring 850ml (scant 1 1/2 pints/3 1/4 cups) water to the boil in a saucepan, sprinkle in the rice, the rest of the butter and salt to taste. Cook until the rice is tender. Drain, reserving 3 tablespoons of the liquid. Cook the chopped tomato in the reserved rice cooking water, seasoning it with salt, pepper and sugar. It should take about 5 minutes or until the tomato is “melted”. Add this and the drained rice to the pot and simmer for a further 5 minutes to allow the flavours to mix. Correct seasoning with salt and pepper and perhaps a pinch of salt. Add the chopped herbs, stir once or twice and serve accompanied by lemon quarters. Next day, transfer the chicken and the marinade to a casserole. Add the onions, parsley, coriander and cinnamon stick and half cover with water. Bring to the boil, cover and simmer gently for about 30 minutes, turning the chicken pieces frequently in the liquid. Add more water if it starts to reduce. Cook for a further 15 minutes, partly covered, until the chicken is tender and almost falls from the bone. Add half the preserved lemon and the olives and continue cooking for a further 5-6 minutes so the flavours combine. Transfer the chicken pieces, lemon and olives to a serving dish and cover to keep warm. Remove and discard the cinnamon stick. Reduce the sauce uncovered until it is about 250ml (9fl oz). Add the lemon juice and season to taste with more salt and freshly ground pepper. 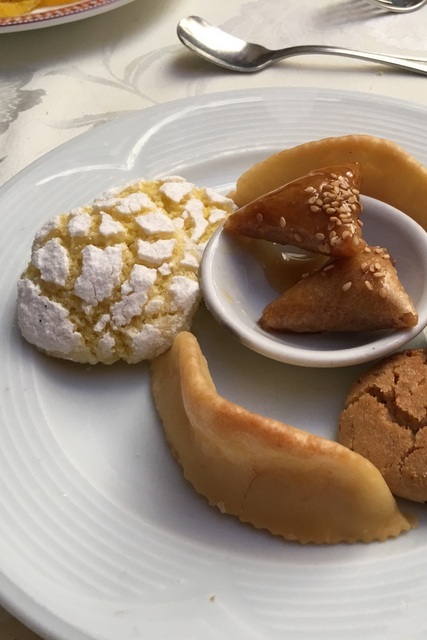 This is a classic dessert in Moroccan restaurants. The combination is a perfect palate cleanser after a rich tagine or cous cous. One could also add a few fat deglet noor dates. Peel the oranges and remove the pith with a sharp knife. Slice the oranges across the equator, flick out the pips and arrange the rounds, slightly overlapping on a circular plate. Dot with cinnamon and caster sugar and drizzle with orange blossom water. Chill well before serving with shredded fresh mint or mint sprigs sprinkled over the top. Mix the almonds and sugar. Add the extract, rose water, and egg whites and work to a smooth paste with your hand. Role into walnut- sized balls, flatten them slightly, and place in little paper cases or on greaseproof or parchment paper on a baking sheet. Bake in a preheated 180°C/350°F/Gas Mark 4 oven for 25 minutes. Let them cool before dusting with icing sugar. Wild Garlic is in full season at present, both the broad leaved ramps or ramsons, (allium ursinum) and the allium triquetrum which grow along the edges of the roads and looks like white bluebells. The flowers are delicious scattered over salads and savoury plates. The wide leaves of ramps are also delicious in salads and wild garlic pesto but this woodland plant doesn’t flower until later and has a distinctive ‘pom pom’ flower – also edible of course. Make the most of both while in season. Here at the Ballymaloe Cookery School, we run 3 Three Month Certificate Courses every year for students who want to gain the skills to earn them a living from their cooking. 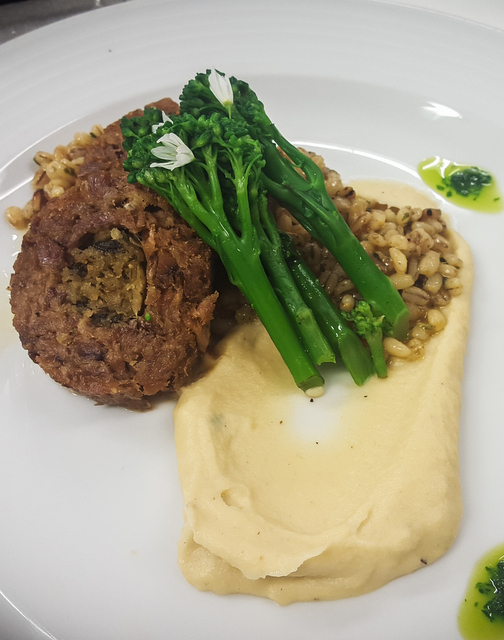 They come from all over the world and knuckle down for 12 weeks to learn as much as they possibly can about how food is produced and where it comes from and how to cook it simply so there’s a ‘Wow’ factor on each plate. Apart from all that, many are united with a passion to contribute to society in a meaningful way. A few weeks ago we met Suze Gibson who has volunteered for 6 months with Seva Mandir, an inspirational NGO based in Udaipur in India who work with tribals in remote villages in Rajasthan. Others link with charities closer to home. Recently a group of Ballymaloe Cookery School students came together to do a Pop Up dinner here at the school to raise money for the East Cork Slow Food Educational Project which teaches local children in nine local schools how to grow and cook. It was a terrific event. The students liaised with several of our senior tutors. They choose the theme, designed the poster and the menu. The starter was Ardsallagh goat cheese with beetroot and preserved lemon dressing. 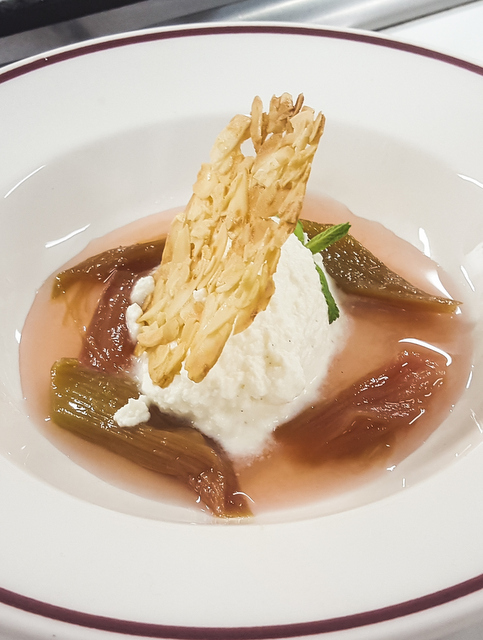 Everything was done from scratch so the student grew the pea shoots in seed trays, picked the wild garlic flowers and made the carrot jelly that decorated the plate from freshly juiced carrots. Others made the natural sourdough bread and ciabatta , a three day process. Not content with that, the Jersey butter was also home made, shaped into candles and served along with little Ballymaloe match boxes full of sea salt. The main course of Lamb breast with Gremolata stuffing was slowly braised. The meat then shredded, seasoned and mixed with herbs and spices to make delicious little lamb rissole. This was served with a pearl barley, celeriac puree, purple sprouting broccoli and a gratin of potatoes. The students picked the little organic leaves for the green salad. The desert was new seasons’ rhubarb compote with cardamom and vanilla ricotta served with an almond and ginger tuile. Some of the beautiful tender ricotta was homemade from the Jersey whey from our tiny herd, but most came from Macroom Cheese. How could one choose? Guests enjoyed those with a cup of coffee. Oh, and I almost forgot the aperitifs, a rhubarb and strawberry cocktail to sip with anchovy straws, home grown radishes on a crostini with olive butter and last but not least, homemade cheese crackers with a few flakes of warm smoked cod with horseradish aioli. They didn’t catch the fish but they did hot smoke it and made the horseradish mayo and crisped the caper to sit on top. The gardeners provided the music and another of the students played the guitar gently in the background. A wonderfully convivial and delicious evening. We were so proud of them all as the guests polished off their plates and showered them with richly deserved compliments. They learned how to organise and pull off on an event down to the last detail including creating the recipes and sourcing the food. The theme was Masquerade so many of the guests arrived in masks and students who didn’t have a mask made their own from foraged leaves and feathers and decorated the dining room to the carnival theme. If you wish you’d been there, contact us at slowfoodeastcork@gmail.com and we’ll let you know the dates of the next event. Meanwhile here are some of the delicious dishes for you to create your own. …. Have you a block about making your own pastry? Each spice has up to five distinctly different flavours, depending on how you use it, so we will illustrate how to choose the most fragrant spices, how to dry, roast, grind, store and flavour a tarka. Dishes will also include fresh ginger, a variety of chillies, lemongrass and fresh lime leaves, curry leaves and galangal – flavours which soon become addictive! This course will take the mystery out of spices and change your cooking forevermore. Preheat the oven to 160°C/300°F/gas mark 2. Season lamb breasts generously on both sides with salt and freshly ground pepper. Lay skin side up on an oven tray. Roast for 20 minutes and reduce to 120°C/250°F/mark 2 for 1½ hours by which time lamb will be tender and much of the fat will have rendered out. Pour all the juices and fat into a pyrex bowl, save and chill. Meanwhile make the gremolata stuffing. Heat 4 tablespoons extra virgin olive oil in a saucepan and sweat the diced onion and crushed garlic until soft but not coloured, 5-6 minutes. Add the white breadcrumbs, chopped parsley lemon zest and juice. Season with salt and freshly ground pepper. Cool, shape into two 1 inch rolls and wrap in cling film, twist the ends. Freeze. When lamb is cooked remove the tough outer skin and bones or cartiledge. Shred the tender meat with the forks, chop finely on a timber board. Season with sea salt and freshly ground pepper. Lay a sheet of clingfilm on the worktop, spread the seasoned lamb evenly into a rectangle – a generous ½ inch thick. Lay the rolls of frozen gremolata down the middle and then use the clingfilm to help wrap the lamb securely around the gremolata. Twist the ends tightly. Refrigerate overnight or even 2 days ahead. On the day make the pearl barley risotto. In a hot frying pan, toast the pearl barley, tossing regularly over a high heat for 2-3 minutes. Heat 2 tablespoons extra virgin olive oil in a saucepan, add diced onion and carrot. Sweat for 4-5 minutes over a low heat. Season with salt and freshly ground pepper. Add toasted pearl barley and toss to coat each grain, stirring all the time. Slowly add hot chicken stock a ladle fill at a time stirring regularly until it’s cooked – approximately 40 minutes. Taste, correct seasoning and stir in lots of chopped parsley. Next make celeriac puree and wild garlic salsa verde. To make the wild garlic salsa verde. Whizz all the ingredients except the oil in a food processor. Add oil as if for pesto to loosen. Taste and correct seasoning. Next make gravy. Lift off the layer of fat. Put the lamb juices into a saucepan, add 1 pint of chicken stock and ½ teaspoon of Dijon mustard. Bring to a boil. Whisk in a tiny bit of roux. Taste and correct seasoning. Preheat oven to 160C. Remove lamb from fridge and unwrap. Cut the roll into 1 inch sheets. Arrange in a single layer on a baking sheet. Put in the preheated oven for 20 minutes until heated through. Spoon a little of the gravy over the top. To Plate. Cook the purple sprouting broccoli in boiling salted water for 3-4 minutes. Drain. Put a dollop of celeriac puree onto each hot plate. Smear with a spoon, a generous portion of hot pearl barely risotto at a right angle. Pop two lamb breast rissoles down the side. Lay a few pieces of purple sprouting broccoli on top. Garnish with wild garlic flowers and put a few dots of salsa verde along the side. 2 large celeriac, 700g (1½lb) approx. Meanwhile, scrub and boil the potatoes. Peel and put into a food processor together with the celeriac. Add the butter, chopped herbs and cream. Season with salt and freshlly ground pepper. Taste and add a few drops of lemon juice if necessary. First make the olive butter. Cream the butter, add the finely chopped kalamata olives. Just before serving crisp the thinly sliced bread in the oven. Spread the olive butter over each. Top with two slices of crisp radish. Garnish each with a sprig of chervil and a flake of sea salt. First make the crackers and stamp into 2cm (1 1/2 inch) diamonds (see recipe). Heat 1cm (1/2 inch) of oil in a small frying pan. Drain and dry the capers. Toss a few at a time in the hot oil. The capers will open out like flowers, drain on kitchen paper. Just before guests arrive, arrange the crackers on a platter. Put a couple of flakes of warm smoked fish on top of each one. Garnish with a tiny blob of Horseradish Aioli and a crispy caper – so delicious. Put the egg yolks into a bowl with the crushed garlic, mustard, salt and the white wine vinegar (keep the whites to make meringues). Put the oil into a measure. Take a whisk in one hand and the oil in the other and drip the oil onto the egg yolks, drop by drop whisking at the same time. Within a minute you will notice that the mixture is beginning to thicken. When this happens you can add the oil a little faster, but don’t get too cheeky or it will suddenly curdle because the egg yolks can only absorb the oil at a certain pace. Finally add the chopped herbs, sugar and grated horseradish, taste and season if necessary. Leave for at least an hour but not more than 3 hours. Dry the fillets with kitchen paper, place on a wire rack and allow to dry in a cool, airy place for 30 minutes approximately. Sprinkle 2 tablespoons of sawdust (we use apple wood) on the base of a rectangular biscuit tin or smoking box (www.nesbits.ie). Put a wire rack into the tin and lay the fish, flesh side up on top. Put the box on a gas jet over a high heat for a minute or so until the sawdust starts to smoulder. Cover the box. Reduce the heat and smoke for 6-7 minutes, turn off the heat and allow to sit unopened for 5 minutes. Day before – make the spiced carrot jelly. Cover the beetroot in cold water and cook the beets until tender, depending on size, 40 minutes to 1½ hours. The beets are cooked when the skin rubs off easily. Whisk all the ingredients for the dressing together. Add the diced preserved lemon. Once tender, peel beetroots and cut into bite size wedges. Toss in dressing while still warm. Whisk the goat cheese and cream together lightly. To serve. Put 3 wedges of beetroot and 3 teaspoon-size quenelles of goat cheese on each plate. Top with a bunch of freshly harvested peashoots and add five, ½ cm (¼ inch) of carrot jelly around the edge of the plate. Garnish with wild garlic flowers. Food Awards are ‘two a penny’ these days. Some carry more cachet that others, all thrill the winners and provide much appreciated exposure. The Irish Food Writers’ Guild Food Awards, now in their 22nd year celebrate indigenous artisan food and drinks businesses that create high quality products from our beautiful Irish raw materials. These awards are unique. No one can enter themselves or their product into the awards and no company knows it has been nominated or shortlisted for an award. So it’s a fantastic surprise. The Guild is the sole nominating and decision-making body. This year was particularly noteworthy and exciting because it showcased the new energy that is emerging from the Midlands of Ireland. There were six winners including the first ever award for Irish stout. The award ceremony was hosted at Michelin starred restaurant Patrick Guilbaud in Merrion Street, Dublin. Chef Guillaume Lebrun cooked a super delicious lunch using the prize winners produce. Sharon and Gordon Greene of Wild Irish Foragers became entrepreneurs almost by accident. While they were walking on their fifth-generation midlands cattle farm just outside Birr, their daughter Emily pointed to a rosehip in the hedgerow and asked, ‘What’s that?’ Their journey to pass on and preserve almost forgotten knowledge and skills eventually led to the family creating a unique business as producers of artisan syrups, jellies, shrubs and sauces made from hand harvested wild ingredients based on traditional recipes discovered by ‘rooting around’ in rare old cookbooks. Another of my favourites Silver Darling Herrings. When Kirsti O’Kelly moved to Ireland from her native, Finland in 1999, she craved the taste of Nordic pickled herring, so decided to start to produce her own according to family recipes passed down from her grandmother. Her friends loved them so was convinced that the Irish palate was ready for her traditional pickled herrings with a contemporary twist, so Silver Darlings was born. The Special Contribution to Irish Food Award went to Joe Fitzmaurice of Riot Rye, Co. Tipperary, another worthy winner. Joe Fitzmaurice is a man on a mission to teach everyone who would like to learn how to make bread without the use of industrial additives or chemicals – or ‘real bread’, as many devotees define it. You can contact Joe and his wife and business partner, Julie Lockett, at their Riot Rye Bakehouse & Bread School in Cloughjordan. The Environmental Award went to another of my favourite and certainly most entrepreneurial food producers, Rod and Julie Calder-Potts. In 2013, they won an IFWG Food Award for their Irish Orchard Syrup, pure concentrated essence of homegrown apples from their organic orchards at Highbank Farm in Co. Kilkenny. The orchards were originally planted by Rod and Julie in 1969 to complement the former hop gardens and converted to organic production in 1994. This began the process of returning the farm to a more environmentally inclusive husbandry. Over time, they have added two small lakes, woodlands and various wildlife habitats. No chemicals are sprayed on the apples, while herbicides, chemical fertilisers and manure from animals fed on GM food are strictly avoided. Allow 50g (2oz) of labneh per person and divide between 6 chilled plates. Make a little indent with a teaspoon in each portion of labneh and pour in the apple syrup followed by the olive oil. Place 2 radishes on each plate beside the labneh. Break the mint leaves over the radishes. Place two or 3 blue cheese Sheridan’s crackers on the plates and finish off with a sprinkle of Maldon sea salt and freshly ground black pepper. Proper natural sourdough is a revelation in terms of flavour and texture not to mention nourishment. This simple recipe is much more than the sum of its parts! Whisk the lime juice and extra virgin olive oil together. Toast or grill the bread. Stone and peel the avocado and slice into chunky segments. Place the avocado on top of the toast – allow 1/2 per person. Drizzle with the dressing. Sprinkle with a few chilli flakes. Garnish with fresh coriander leaves and a few flakes of sea salt and some freshly ground black pepper. Melt the butter, caster sugar and stout in a saucepan. Add the orange zest and the fruit and peel (except the cherries). Bring the mixture to the boil for 3–4 minutes, stirring frequently. Remove from the heat and leave to cool until it is lukewarm. Sieve the flour, bicarbonate of soda and mixed spice into a mixing bowl. Add the fruit mixture to the flour and add the cherries. Whisk the eggs; add them gradually, mixing evenly through the mixture. Bake in the oven for about 1 hour and 10 minutes. If you wish, when the cake is cooked, you can pour 4 tablespoons of stout over the top. Keep for 2–3 days before cutting. Preheat the oven to 160°C. Scatter the buckwheat on a baking tray and toast in the oven for 5 minutes. To make the green leek purée, melt the butter in a small pan and sweat the leeks. Season with salt and pepper, then blend in a liquidiser until smooth. Chill in the fridge until required. Boil the baby potatoes until they are cooked through and tender. Drain well and return briefly to the pan to dry them out, then transfer to a bowl and gently crush them. Fold in the yogurt, some chopped chives and a squeeze of lemon juice, but be careful not to overwork the potato salad. To serve, arrange three small quenelles of the potato salad on a cold plate and add dots of the leek purée and yogurt. Place a sliver of shallot on top of each quenelle, then add a piece of herring. Garnish with a parsley leaf and the toasted buckwheat. The last course was oversubscribed with many people asking when the next half day course is scheduled….so on Wednesday April 6th Darina Allen will pass on the tips and advice gleaned over years of feeding children and grandchilden totally without packets, cans or jars! You’ll soon discover that making your own, nourishing baby food is quick, easy and surprisingly good fun. Not only will it save you a small fortune but also it will be infinitely better for your baby. Also, by giving your baby lots of variety you’ll ensure that as they grow up they don’t become fussy eaters. www.cookingisfun.ie for more info. Devotees of the multi award winning chef Sunil Ghai will be delighted to know that his much anticipated new restaurant has opened on Camden Street in Dublin. It’s called Pickle – definitely a name for your Dublin dining list.